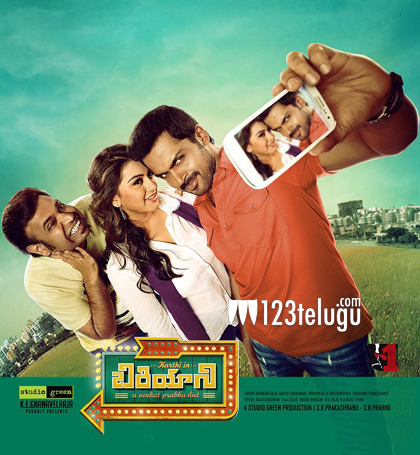 Karthi, Hansika starrer Biriyani is going to hit the screens on December 20. Directed by Venkat Prabhu, the film narrates the story of couple of friends who go in search of Biriyani one night and how they land up in trouble. K E Gnanavel Raja is producing this film under Studio Green banner and it’s going to be dubbed in Telugu as well. Premgi Amaren and Mandy Takhar are also playing important roles in this action entertainer. Interestingly, the film was earlier supposed to release in January, 2014; however, with Rajinikanth’s Kochadaiiyan joining the Pongal race, the release date of Biriyani has been advanced by nearly three weeks. Yuvan Shankar Raja has scored the music. The film’s shooting was wrapped up long ago; however, Karthi decided to go ahead with his other film, All in All Azhagu Raja’s release prior to Biriyani. Two of Karthi’s previous films, Sakhuni and Alex Pandian sank without a trace in Telugu. It remains to be seen how the Telugu version of Biriyani performs at the box-office. More details about the film will be revealed soon.